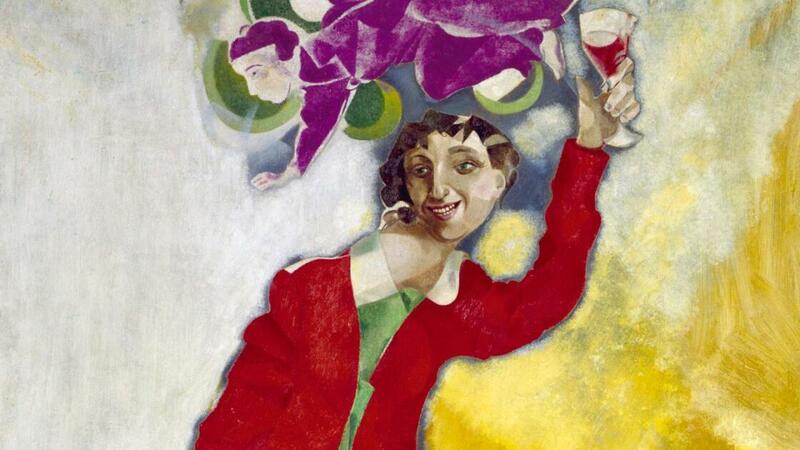 A picture of marital bliss, Marc Chagall’s "Double Portrait with Wine Glass" beautifully blends Surrealist and Cubist styles with Russian folk art. 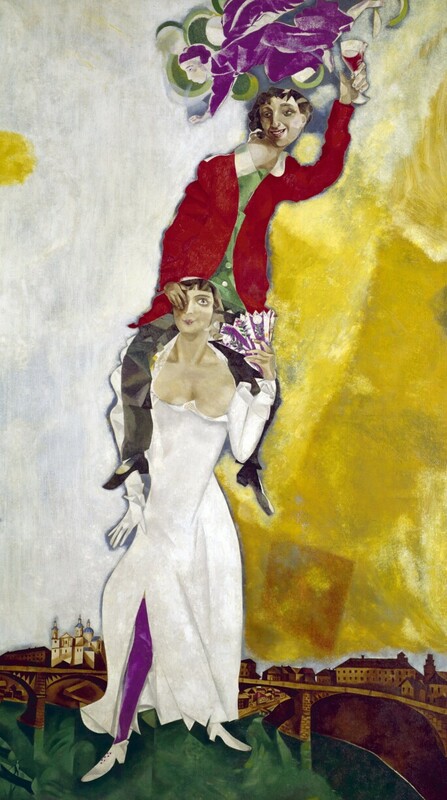 P ainted circa 1917–18, Chagall’s masterful Double Portrait with Wine Glass presents an image of love transcending all things. In this wedding portrait, the artist places himself on the shoulders of his first wife, Bella Rosenfeld, as the couple soar over the Belarusian city of Vitebsk. Although married two years earlier, she is pictured in her long white wedding dress. Yet this joyful picture was created in the first winter of the Russian Revolution, an event for which Chagall had conflicting emotions. Initially, he worked for the Bolshevik cause, helping to set up an art school in Vitebsk, but later his idiosyncratic style fell out of favor with other faculty, who preferred the circle and squares of the suprematist style. Chagall resigned and moved to Moscow, before heading back to France. “Great art picks up where nature ends,” remarked Chagall. And indeed, in his palette and compositions he expanded and developed what he found beautiful in life. While his works flirted with Surrealism and Cubism, his style was unique, influenced as it was by his love of Russian folk art. His colors were electric – his red jacket and Bella’s purple stocking pulse out from the canvas in Double Portrait with Wine Glass – and his scenarios tumbled into the fantastical and dreamlike. He first pictured Bella flying in Birthday, a 1915 painting of the couple floating around their kitchen. 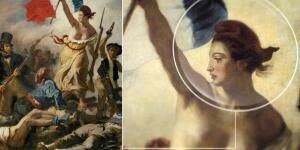 And he would keep her aloft, at least on canvas, long after her passing in 1944. 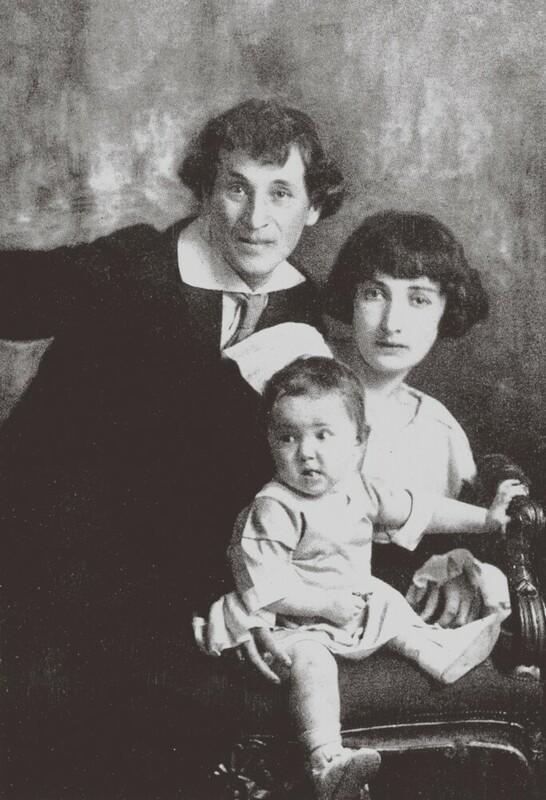 Marc Chagall with his first wife Bella and daughter Ida. Photograph by Fine Art Images/Heritage Images/Getty Images. Chagall died in the French Riviera in 1985, aged 97, but during his long life the image of flying lovers would continue to be a central motif of his work. This subject and other major themes – such as couples embracing and kissing, floral displays and circuses – have featured prominently in the numerous works by Chagall sold at Sotheby’s. 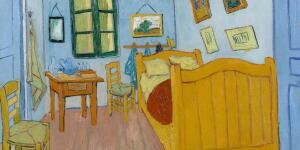 In 1990, L’Anniversaire (1923) – a later version of his 1915 painting Birthday – sold for $14.9 million, and remained a record for the artist’s work for 27 years. 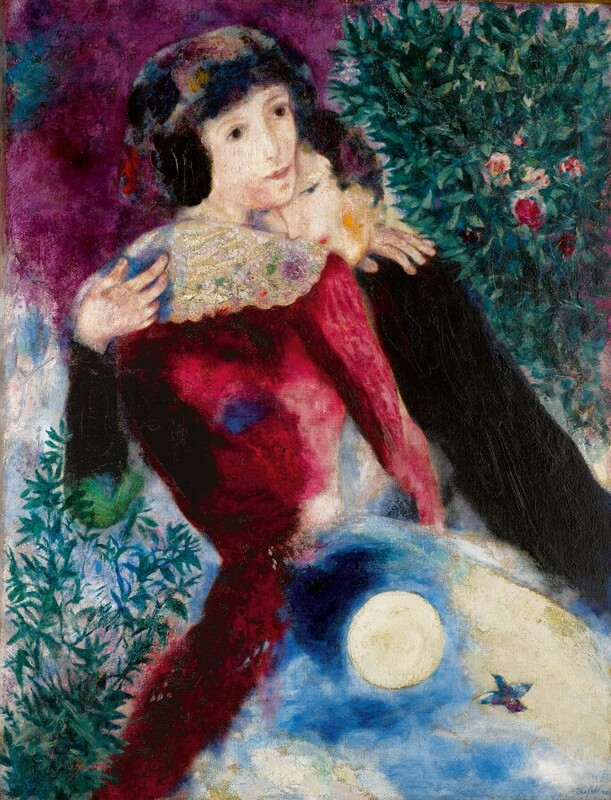 Until, that is, Sotheby’s achieved a new record with the sale of Les Amoureux (1928) – another of Chagall’s paean’s to Bella – which sold for $28.5 million. Marc Chagall, Les Amoureux, 1928, sold for $28,453,000 at Sotheby's in November 2017. Double Portrait with Wine Glass is one of the highlights of the permanent collection of France’s National Museum of Modern Art housed in theCentre Georges Pompidou. It was first exhibited in Paris in 1937, at the Petit Palais, by which time Marc and Bella had relocated to the city. It has travelled the world, thrilling audiences at major Chagall retrospectives in Japan (Tokyo Metropolitan Art Museum, 2002), America (San Francisco Museum of Modern Art, 2003) and, appropriately, Russia: both at Galerie Tretyakov in Moscow and Musée National Russe in Saint-Petersburg (2005).